How to find a practical use for a narrow space next to the window using fruit crates as a shelving. I am in process of restyling my sons’ bedroom. I would like their room to be nice, comfortable but also to make practical use of the space. My challenge is to make the room functional for two boys and not over cluttered. Of course, there are things that are necessary for the bedroom like a bunk bed, wardrobe and a chest of draws. Lucky enough the boys’ room is the size of a smaller double bedroom so there is decent floor space for all the mentioned items. 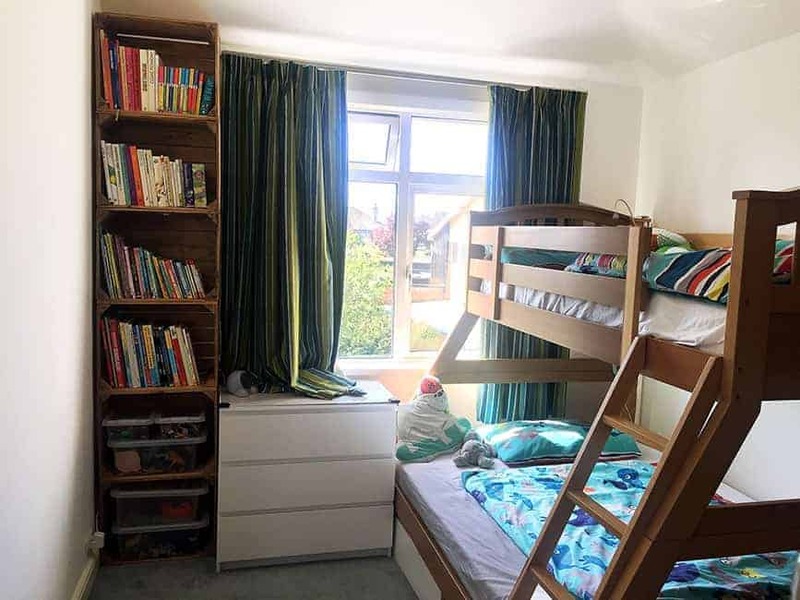 As we like reading before bedtime we’ve got the boys a big bunk bed with a single bed at the top for my older son and a double bed at the bottom for my younger one (I know he is so lucky to have all that space just for himself). 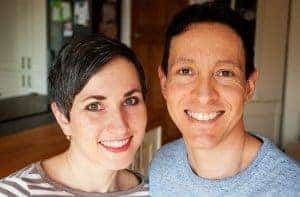 But it means we can all comfortably snuggle together and read bedtime stories in the bed and not on the floor in the evening. We read in English as well as in Czech. I like to give the boys the opportunity to learn both languages. Listening to stories is fun and helps them to broaden their Czech vocabulary. Our collection of children books is progressively expanding. So for me was important to fit a bookcase into the boys’ bedroom too. Because of the bedroom layout, I had only one space left for it. Unfortunately, it was very narrow space in the corner of the room right next to the window. It wasn’t wider than 51 cm. I spent some time trying to find the perfect size bookcase but I wasn’t happy with anything I saw. 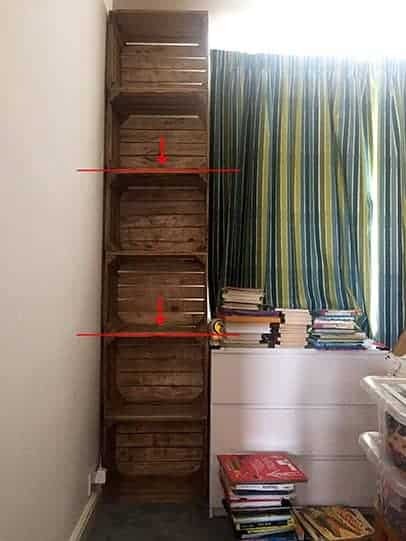 Some of the bookcases were too narrow and were missing around 10 – 15 cm, others were too wide and none of them was tall enough to go all the way up to the ceiling (believe me I hate wasting a space). Another obstacle was a price. Honestly, I wasn’t ready to spend a few hundred pounds for made to measure bookcase because there are always more important things to pay for than my sons’ book storage. While not being able to find anything to my liking from furniture retailers I turn my interest to DIY. As we all know, the best place to go, when looking for some ideas, especially crafts or DIY, is Pinterest. 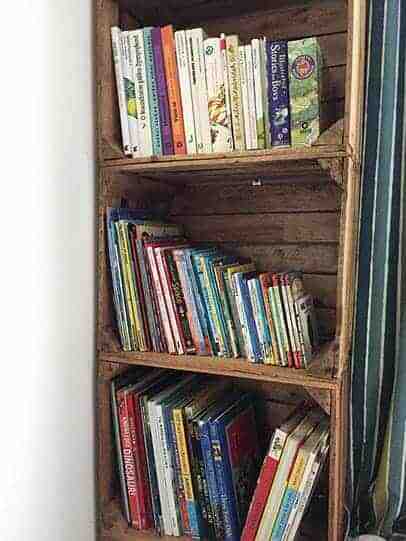 Between all those brilliant ideas I favoured pictures where people used garden/fruit crates to build their shelving. The crates are narrow and stackable, creating nice storage boxes. There was another bonus. I am in love with rustic, country style design and the crates are just perfect for it. After finding some sellers of shabby fruit crates on eBay, I checked the dimensions of their products and found the one that couldn’t fit better to my narrow space. I was actually incredibly lucky as not only the width was spot on but also 6 crates stacked on top of each other reaches the height of the ceiling. I couldn’t wait for my 6 crates to arrive. But when they did I realise they had some rough, splintery edges that would be better to sand down first. 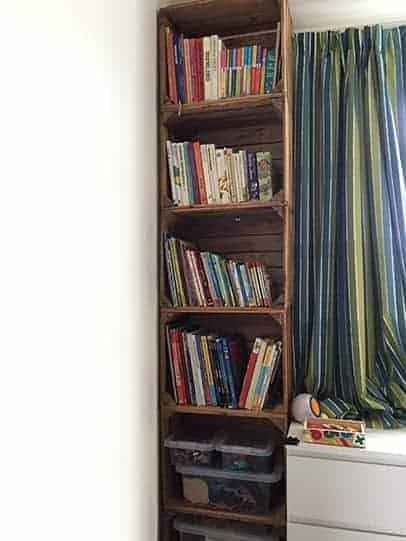 Unfortunately, I didn’t have any sand sheets left for our electric sander and I was so impatient and very eager to assemble our new DIY shabby chic crate bookcase that I decided to skip the sanding (the boys haven’t complained so far). I screwed together all the crates into pairs so I had 3 parts each consisting of two crates. Next step was to stack them on top of each other and attach them to the wall. I wouldn’t leave heavy furniture free standing anywhere in the house and especially not in the children bedroom. Children are very creative and often come up with excellent ideas that involve climbing. If tall furniture is not attached to the wall, it’s a bad accident waiting to happen. To attach the crates to the wall I used two corner brackets 10 x 10 cm. 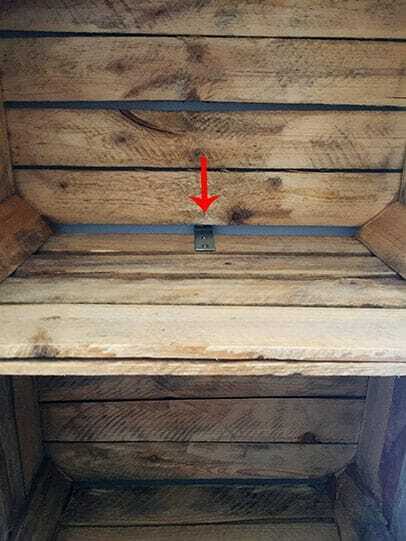 One is in the middle, between the second and third crate secured to the bottom of the third crate and the second bracket is between a fourth and fifth crate as the bookcase is quite high. I know this style is not for everyone. I like combining new, modern with old and rustic. I like being creative and practical at the same time. Which is not always straightforward to do. I’ve tried to prioritise style and looks over functionality many times but I’m never completely satisfied with something that looks good until it ticks all my practical requirements too. It’s why I was very pleased with the boys’ new bookcase. I like its style and looks, plus it doesn’t leave any unused space. The boys are using bottom two crates as a toy storage and the rest is for all their books.